This is a sponsored post I wrote for USFRA (US Farmers and Ranchers Alliance). All opinions are my own. If there is anything that farmers can agree on is the fact that farming practices have changed. Farmers are doing a much better job than years past due to the use of new technologies. And I am speaking about GE technology (Genetically engineered crops). Prior to genetically engineered crop technology (about 25 years ago), I remember driving at night on our rural gravel roads and seeing a “sea of moths” in our headlights during the months of July and August. I knew exactly what they were – European Corn Borer moths. I cringed when I saw them because I knew the damage they were causing our corn plants. The corn borer, in its larvae form, caused significant damage to our corn plants by burrowing into the center of the stalk, which then caused weakness in the corn stalk. The corn stalk weakness resulted in 8-10′ corn plants toppling to the ground and decreased our corn yields due to insect damage. Harvesting corn that has fallen to the ground is very difficult, if not impossible. Not only were insects a challenge, but weeds were hard to control as well. Back then, weed control in corn fields were controlled by using concoctions of different herbicides, trying to find the right combination to eliminate each different type of weed. It usually resulted in multiple spraying trips over the fields. Many times our “plan” didn’t work out– mostly because of weather conditions such as rain, wind, temperatures, or the weeds just grew too fast and too big. In addition to herbicides, we cultivated our fields two to three times per year. Cultivating is like hoeing in-between the rows of plants. If the weeds became too large, we usually succumbed to defeat because we had no other options. We hung our head down and told ourselves . . .
Fast forward to about 20 years ago when we planted our first genetically engineered crop — Bt (Bacillus thuringiensis) corn. Bt is a protein, found in the soil bacterium naturally. Bt-corn has the genetic code to produce the Bt protein, which targets a small group of larvae including the Lepidoptera larvae, which is the European Corn Borer. The advantage of using Bt corn is we don’t need to use a full cover insecticide spray, therefore, not killing all insects. And better yet, Bt has been proven to be safe for humans because the human gut and skin lack receptors that can recognize or interact with Bt. We were excited about its promises and more excited that it worked! No longer did we have insects damaging corn plants. Farmers were celebrating this breakthrough technology! In addition to Bt-corn, other new GE crops reaching the market were Roundup Ready (RR) corn or RR soybeans. Roundup or glyphosate (herbicide) is very effective at killing plants. When glyphosate is sprayed onto a plant, it is absorbed through the plant tissues (leaves and stems) where it interferes with the production of the enzyme EPSP synthase. This prevents the plant from manufacturing some amino acids essential for life. Roundup works very well on many types of weeds, with the exception of the petunia flower. In the case of glyphosate (Roundup) resistant plants, a gene was taken from a petunia plant (that was naturally resistant to glyphosate) and placed into plants such as corn, soybeans and sugar beets. These GE crops were now resistant to glyphosate or Roundup and it revolutionized weed control. Today, we apply a pre-planting herbicide and then when our corn is about 12 inches high, we apply one more application of herbicide that includes Roundup and other companion herbicides (to help with weed resistance). The amount we apply is equivalent to less than two soda cans over an acre (an acre is about the size of a football field). It is another four to five weeks before the beginning of visible ear of corn. That’s it. No cultivating, no more spraying. The biggest benefit we see in using in our genetically engineered crops is we use LESS pesticides and our yields are better because of less pressure from insects and weeds. We use fewer resources because we are making fewer trips over the fields. And to me that makes GE technology very sustainable. GE technology is truly a win for the environment, our soils and ourselves. As a farmer, we are continually looking for ways to be more environmentally friendly while enhancing our crops. And this is why I grow GE crops. Is it Safe to Feed My Family GMOS? 1) GMOs are not foods. GMOs are not Round Up or Glyphosate. 2) Herbicide resistant weeds, or “superweeds” are not caused by GMOs. The reason we have “superweeds” is because weeds continually change to resist pesticides. Superweeds are not new. Weeds have always changed (on their own) to resist pesticides. What would happen if they didn’t? Weeds would be extinct. Yes, farmers have relied on Round Up (glyphosate) for quite a few years because it was so effective, low cost and much safer than other pesticides. But as weeds do, they are becoming resistant to Round Up as well as other herbicides used in the past. The solution? Farmers have been slacking. They need to continually change their weed plan using several methods, including crop rotation and other pesticide control measures to combat weed pressures in their fields. 3) The medical community uses GMOs. Perhaps the most popular is insulin, which is used by million every single day. Other medical uses of genetically engineering is drug treatments for cancer, Alzheimer’s and cystic fibrosis. Our world is much better because of these medical treatments – all which are genetically modified organisms. And another common misconception – GMOs do not cause autism. Millions are alive today as the direct result of GMO technology. Period. 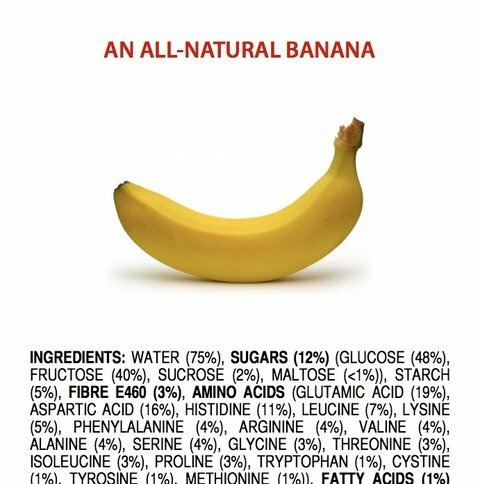 4) GMOs do happen in nature. 5) Europe IS importing feed/food that uses GMO technology. One issue that is constantly brought up by consumers is Europe has banned GMOs. And then it is always followed up with, “why doesn’t the U.S. do the same?” The reality is Europe never banned GMOs (only two countries have outright banned GMOs), but rather, had not approved them. The EU has now authorized the importation of 17 GMOs for food/feed uses. 6) GMO’s are not causing the increase in food allergies. 7) Long Term Studies on GMOs. Probably the most common statement I have seen or read is, “There are no long term studies on GMOs.” There have been GMO studies done on animals where the results show no negative effects on animals. And then the question also becomes, what is considered long term? For the naysayers, there will be no amount of time that will satisfy them. In addition, there have never been long-term studies required on any other new seed variety or crop. GMOs are the only crops that require extensive pre-marketing scrutiny. And think all natural plant foods are always good for us? Think about rhubarb leaves and pits of peaches – all which are poisonous to humans. 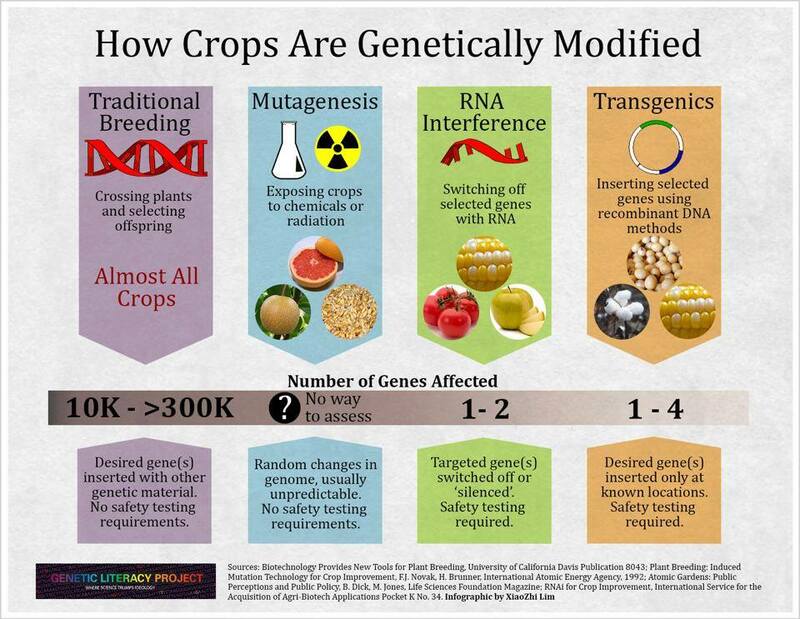 8) GMOs only affect 1-4 genes, where traditional breeding plants affect 10,000 – >300,000 genes. And the 1-4 genes that are changed? Scientists know everything there is to know about them. Using GMO technology allows farmers to use less pesticides. Less pesticides = good for people and the environment. Not only do farmers use less pesticides, but newer GMO varieties include a drought-tolerant trait where plants require less water. There is also the possibility of GMO plants using nitrogen already present in the soil as a nutrient. Presently, plants have a hard to time accessing and using the nitrogen already present in the soils. Biotechnology possibilities are endless. Farmers really do care about what they grow. 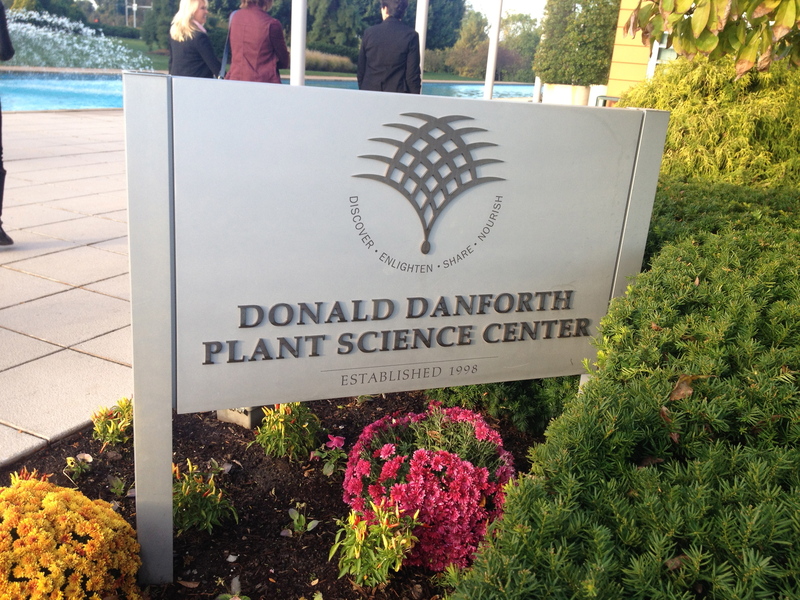 Our goal is to grow safe, affordable food. Farmers rely on expert advice that helps them determine the best seeds to plant. We can plant whatever seed we choose. We are not forced into any seed technologies, choices or certain companies. In fact, read what life was like before GMOs. Farmers choose to plant biotech seeds. We do need to sign a technology agreement that says we cannot save any seed back to plant for future years. We know that and understand that. Personally, we have farmed for over 35 years and we have never held back any seed to be used for the following growing season. And, finally, our farm field (where GMO corn and soybeans are grown) is literally in my backyard. Why would we grow something dangerous to our health right in our backyards? We really do care. We know GMOs are not the only solution, but just a single tool in our farming toolbox. And it seems farming requires multiple tools and I also believe our “toolbox” will continue to grow in the future.